Meanwhile, the groom’s mother is surprised as for why the girl went out during the Goldhana function. Just then Abir and everyone else comes and he tells the groom that he wants to talk with him but Meenakshi tells them that today this function will not happen and tells them to forgive them for that. There Kuhu comes home, Rajshree and all welcome Kuhu, Rajshree is tense as where is Mishti and asks her but she does not answer and change the topic. Seeing Rajshree tense, Vishvambhar tells her not to worry and that she will come home. Meanwhile, at Ketki’s house, her mother is shocked to hear that Meenakshi herself cancelled the function. Abir wants to tell them but Meenakshi does not allow him to talk. Meenakshi says that if Ketki wants only then we will agree for the marriage. Meenakshi manipulates Ketki’s mind and convinces her to agree for the marriage. All are happy as Ketki is ready for the function. Ketki changes and comes down for the function (hey shubharambh ho shubharambh track is played in the background). Yeh Rishtey Hain Pyaar Ke Review: Shaheer Sheikh and Rithvik Arora Steal The Episode; Rhea Sharma Also Impresses Us! Abir is happy as Ketki is happy. When the function is over he leaves the place. Meenakshi asks him to stay back as the function is going on. But Abir says he cannot stay and goes from there. Abir is taking picture’s of the old fort, there Mishti is also sitting remembering her past. While taking a picture he sees Mishti’s photo and smiles, but suddenly he hears someone talking. Abir sees Mishti talking with God and asking why all problems have come her way. 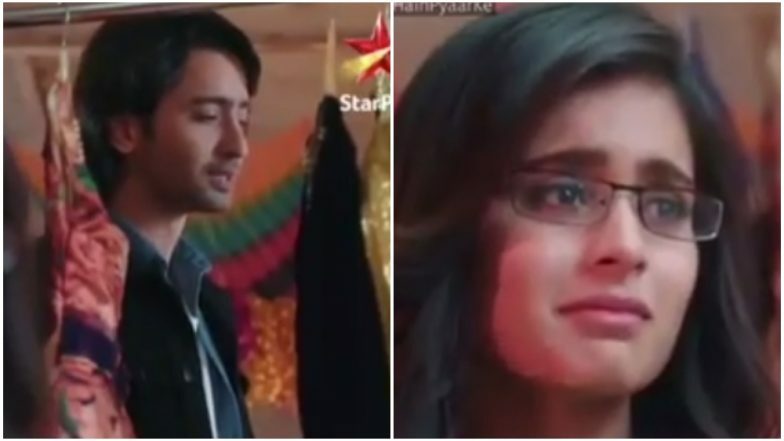 Abir hides and talks with her, she asks who is it, Abir says he is God and asks her what is her problem. Mishti searches here and there, Abir hides from her and asks her not to search for him and that he has come here to solve her problems. Mishti sees him and says why he is behind her and goes from there. Abir smiles. In the precap, Meenakshi is telling that she wants Kunal and Abir to get married if she gets a good match.